Unfortunately there’s been a lot going on over the past couple of weeks which have caused me to be forgetful in updating my blog. I’ve celebrated my daughter’s first birthday, been made redundant from my job and but also been offered a new job! Although its been pretty rubbish to lose my job, I want to speak about the happy thing – Alice’s first birthday. I haven’t done too much baking recently except to bake for her birthday party but I definitely did plenty of baking for that. I made 2 birthday cakes, both sponge with buttercream and fondant icing. The first one, that I will talk about today, was a small cake I made, enough to feed 6 hungry adults and a little lady, I think this equated to an 8″ cake. I didn’t want it to be too large or fancy as we were taking it to West Midlands Safari park and I needed it to survive the car journey and trip round the animals. 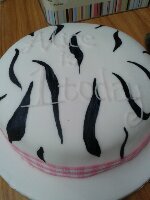 This is one of the reasons why I decorated it with a zebra theme, simple but effective. I iced it with white fondant icing and then used edible airbrush paints to hand paint on the stripes. I was a bit worried it would look a little old for her but it was linked to her day out. I coloured the royal icing, that I used to pipe the writing with a baby pink but on the cake it seemed to come out white. I was quite pleased with the end results and the advantage of painting the cake was that you didn’t have to colour icing black – which is a pain to do. I should have used my big camera (Canon 50d) to do some good photos but the house was so full of things for the party that there was barely room to store the cake!